Now this'll sound silly but this was only the second away game I had gone to since beginning a full time Imp again and I thought the trip to Orient leaving at half 10 was too long to bear, obviously this seems like a comfort now compared to Torquay or Swansea. Anyway, it was the FA Cup second round and a fine Saturday morning greeted all Imps fans. The trip down to London was uneventful but then, when we got there it was a bit of a farce, a mini bus was parked on the street corner where the coach was going to park so we couldn't squeeze round it so we set off into London again and drove around for half an hour before returning where we had been and the mini bus had gone. Driving behind the stands, I couldn't believe my eyes as the ground appeared to be heavily wooden and I wasn't looking forward to it at all. Setting foot in the away end was a bit of a relief because it wasn't as bad as it had seemed. 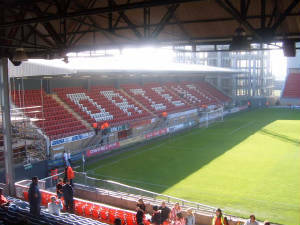 The stand we were in was shared with home fans and provided an excellent view of the action as it was a similar size to the CO-OP stand at Sincil Bank and was at the side of the pitch, the only problem being that there were numerous poles in the way. Leg space wasn't great either and it put me off returning for the League game 2 weeks later (which we went on to lose 5-0). 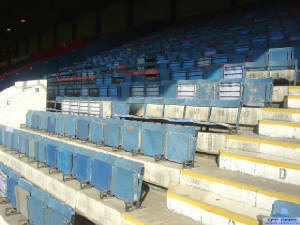 The final point on the away end can be made by saying, how uncomfortable can seats get? Not only were most seats in the away end broken, but they were wooden, extremely uncomfortable and to take the piss even more, they only offered enough space for children to sit in them without being squeezed in between the people either side. 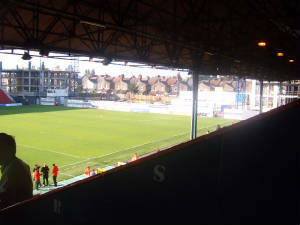 Looking out of the ground was a very nostalgic feel, the stand to the left was the best of the lot with it being an evelated, new seated stand with "ORIENT" written across it. This stand appeared fairly decent but then turning my head clockwise, my heart sank. The stand opposite us was a very old wooden stand with seats that had no back with the final stand being a very large terrace behind the far goal. These two latter stands have since been knocked down and are currently being rebuilt which is a god send. 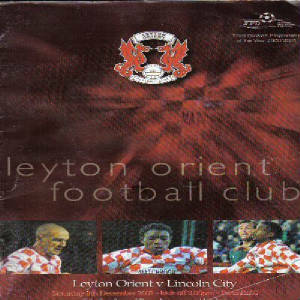 The programme was excellent with many different and rather interesting articles although I was a bit worried that their two "players to watch" were the injured Kingsley Black (he'd been injured for a month before this game) and Tony Battersby and I won't even get into why that's a bad choice. 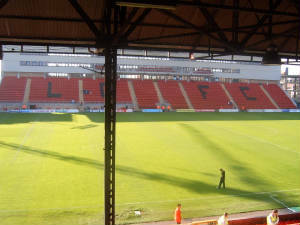 Overall I enjoyed my trip to Orient and will always remember that delapedated look btu I'm definitely looking forward to seeing what their redeveloped ground will look like.